Are you tired of spending hours clearing out your garage to do car repairs that you know could be done in 20 minutes? Or not having “just the right tool” while in the middle of complicated repairs? DitY Auto Repair, the most innovative auto repair shop in central Florida, offers 4000 square feet of fully equipped, safe and accessible work space to fix and repair your car, whether you do it yourself, or we do the work for you. Today, car owners are now keeping their autos longer…up to 10 years or more. The older your vehicle is, the more maintenance it requires…and the more money it costs. This is where DitY can become your wallet’s best friend! Why pay a mechanic $95 an hour when you know you can do the job yourself? At DitY YOU are the mechanic. You can pocket the hourly mechanics fee, do the work yourself and save up to 50% or more on auto repair expenses! Don’t have the space or the tools to do the job? 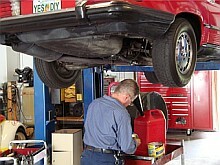 You can “rent” DitY’s auto repair bays and high quality tools as you work in a well-equipped garage. All you need for your car is the desire to do it yourself. No set up, no put back! Get assistance from an ASE certified mechanic or rely on step-by-step instructions to make certain the job is done right, the way you want it done! Or, you can let DitY do the job for you. You may enjoy working on, or installing aftermarket parts to your own vehicle, but don’t like the time required or inconvenience of the prep work and cleanup. Homeowners’ association or condo regulations prohibit you from doing mechanical work on your premises. Now, compare working at DitY to shade tree mechanics at home. At DitY, you have auto repair manuals, equipment, and tools at your fingertips. At home, you have running to the local parts store to purchase one special size socket. No problem! Bring your tools or use our tools and specialized advanced equipment and leave the extra preparation and clean-up work at home. And let someone else worry about the weather. You won’t find this type of service anywhere else in Central Florida except at Do-it-Yourself Auto Repair!